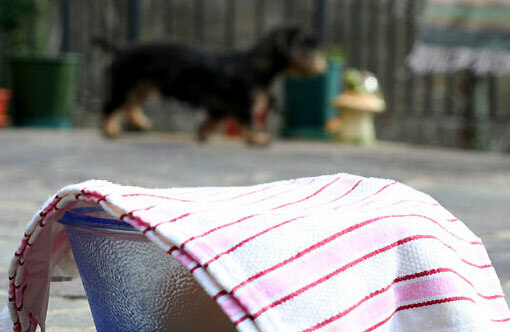 DIY Refrigerator: Solar cool your food with a wet towel! DIY refrigerator: keep it cool with the sun and a wet towel! A normal refrigerator operates on the principal that a boiling liquid takes heat away from its surroundings while it turns into gas. It’s like when you’re sweating: it cools you off. But how to keep your food and drinks cool when your outdoors, on a campsite or when electricity isn’t available? Sure, you can buy one of those fridges which run on gas, but they are heavy when you’re a hiker. If nothing is available, make a DIY refrigerator from a wet towel and a bucket. Oh, and you need the sun as the ‘power source’. 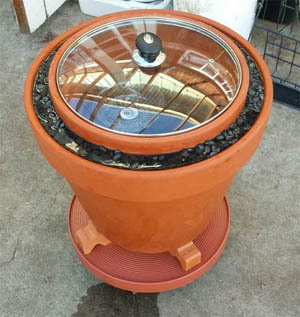 Throw some vegetables and other stuff you want to keep cool in a bucket, put it outdoor in an open spot, which lots of sun (I know, sounds crazy! Keep things cool under the sun?). Wet the towel and put it over the bucket with one end of the towel in a dish or small bucket of water to soak up the moisture on a constant basis. Now what happens is the sun heats this wet towel and the water evaporates off, removing heat from the bucket by this evaporation cooling process. You have to re-soak the towel in order to keep your fridge working. It’s the other way round, instead of putting food in the cold (ice, water, etc. ), you have to put it in the sun! Amazing isn’t it, though the idea isn’t old and has actually been around for ages, using clay based materials. Solar fridges are also used in developing countries, where electricity can be unreliable or is non-existent. In these countries they use pot-in-pot refrigerators, also known as Zeers, which keep food cool by using evaporative cooling. BTW, if you want to build a Zeer, read this article: Busting myths about the Zeer pot. 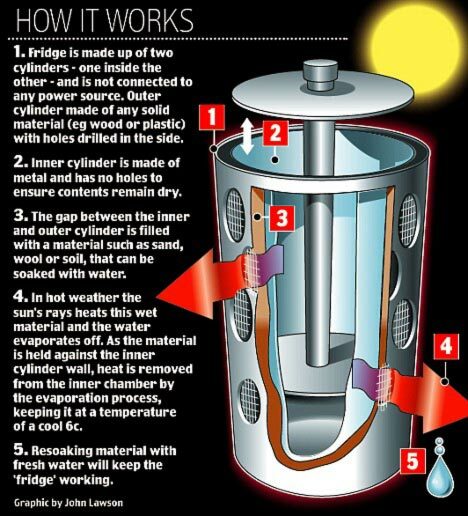 British student Emily Cummins, 21, came up with the idea of redesigning (the Africans used to use two clay jars with a gap in between them rather than metal) this pot-in-pot fridge into a DIY project. It seems that her fridge is now improving the lives of thousands of poverty-stricken Africans and can keep milk and meat cool for days at a temperature of around 6C. Emily’s refrigerator exists of two cylinders: one inside the other. The inner one is made from metal but the outer cylinder can be made from anything, including wood and plastic. This diy fridge uses a solar panel and is designed by a Product and Furniture Designer in the UK. It is a portable aid fridge to transport vaccines and medicines. Or what do think of making ice with only the sun as power source? Take a look at this article about how to build a solar icemaker and you’ll be surprised what you can accomplish! Now start experimenting with a DIY refrigerator!